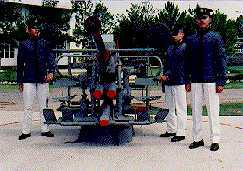 This is a Philippine Navy 40mm Bofors Mark 3 rapid-fire cannon that fires a 2 pound(lbs.) shell a distance of 5.9 nautical miles at a rate of fire of 160 rounds/minute. Standing beside this anti-aircraft gun are cadets from the Philippine Military Academy(PMA). For comments or questions you may send electronic mail to- Antonio Banderas Si usted tiene preguntas, comentarios, o alguna información adicional que le gustaría ver en la Página de la Armada Nacional de la Republica Filipinas por favor enviarlas. Please note that the text portion of this Philippine navy website downloads almost immediately, but the photos portion may take up to 5 minutes so please be patient! Anti-Aircraft gun picture courtesy of the PMA. Bladed weapons pictures copyright of Kris Cutlery. 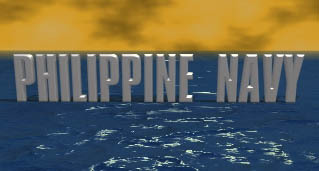 Philippine Navy seal copyright of the official Philippine Navy web page. This is an unofficial page started May 19, 1994.